Are you content with just "business as usual" or are you interested in harnessing the power of business and markets to change the world? The University of Vermont's The Sustainable Innovation MBA program prepares students to create sustainable and profitable businesses, including entrepreneurial “start-ups” and intrapreneurial enterprises within existing companies, to leverage opportunities to create mutual value in a world undergoing transformational change. We're looking for people like you - people not content to do things the way they've always been done - the disrupters, innovators and visionary entrepreneurs. Leaders who think differently and seek a better way to do business, and who are ready to embark on a business education that will prepare them to live differently, lead differently, and profit differently. Give us a year. Together we'll reinvent the way we do business. 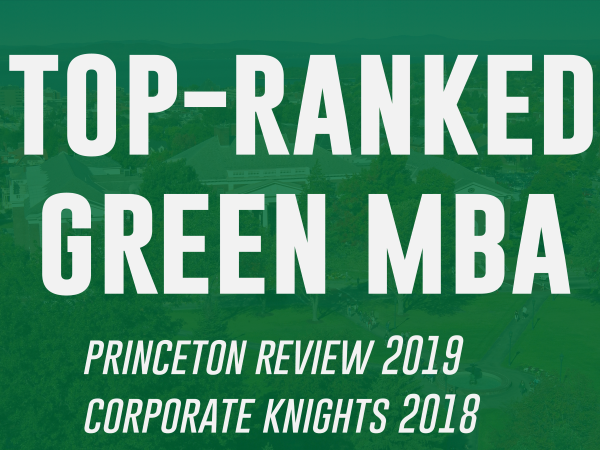 We invite applicants who have evidenced an ability to learn, the potential to contribute to the learning of their classmates, and a passion to grow professionally in ways that fit with the unique goals and attributes of our specialized Sustainable Innovation MBA program. We evaluate each applicant holistically, focusing on a composite of the applicant’s achievements and strengths as a person, which include but extend well beyond a collection of academic transcripts and GMAT scores. Admissions preference will be given to applicants who have 3 or more years of work experience in for-profit, non-profit, and/or government positions, and applicants with international and managerial experience are especially encouraged. Successful candidates will have scored higher than 500 on the GMAT, and those scoring higher than 550 are preferred (we also accept GRE scores in lieu of GMAT scores). The ideal applicants will have earned a GPA of 3.0 or higher on a 4.0 scale in their undergraduate program, and will possess a command of the English language (applicants for whom English is not their primary language should have a minimum TOEFL score of 90). Application requirements also include letters of reference. Above all, we seek students who are passionate about sustainable entrepreneurship and excited to use the power of business to create mutual value for owners and the local and global communities in which they operate. To help prepare our students for success in the program, we allocate resources to provide support for those who wish to develop or brush up on their quantitative skills during the summer months before the start of the first Sustainable Innovation MBA course. Why The Sustainable Innovation MBA? What is The Sustainable Innovation MBA? Who is The Sustainable Innovation MBA?